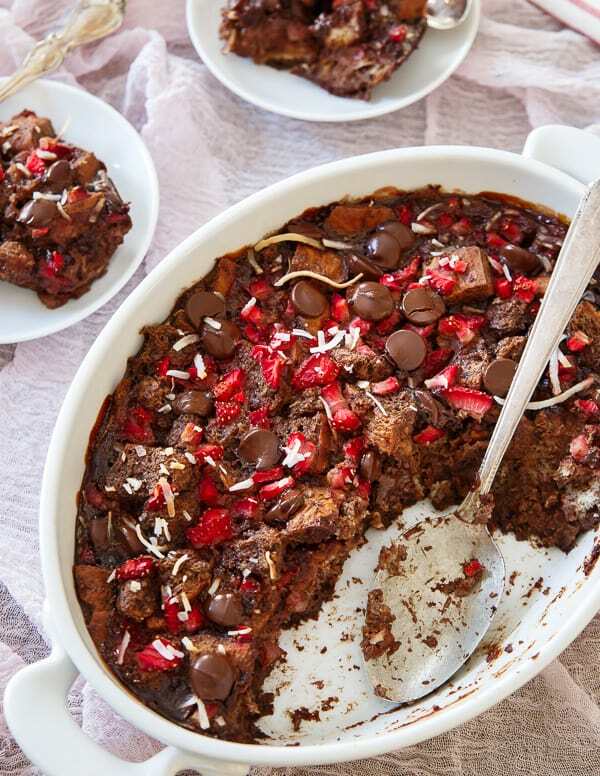 This gluten free chocolate strawberry bread pudding can be a decadent breakfast (perfect for Valentine’s Day) or a deliciously chocolaty dessert! Watch the video below on how to make gluten free chocolate strawberry bread pudding and subscribe to my YouTube channel for more easy recipes. Want to know something I never thought about prior to this recipe? The difference between bread pudding and baked French toast. What say you, dear internet friends, is the difference? Because I spent a solid 30 minutes thinking about it before naming this recipe. Some might say since the bread is cubed instead of kept in sliced form it’s definitely bread pudding and not French toast. However, do a quick google search of “baked French toast” and you’ll find plenty of recipes with cubed bread. Others will say the ingredient list lends itself more to a dessert (bread pudding) than a breakfast with the amount of chocolate going on but then how many cream cheese and mascarpone stuffed French toast recipes are there out there? And those things are just as decadent as chocolate in my opinion. Ultimately, I went with bread pudding. Obviously. But, I’m still not satisfied with the decision and it’s bothering me I’ve spent this much brain space on something so stupid. So call this whatever you want but here’s the deal, it’s ridiculously, outrageously, insanely DELICIOUS. Gooey chocolate chips, bright fresh (surprisingly sweet considering it’s February) strawberries and nutty toasted coconut get layered together with coffee chocolate soaked bread and baked into a moist gluten free pudding. It’s almost like a brownie collided with bread pudding in texture and taste and with Valentine’s Day right around the corner, I vote you can choose to eat it either as dessert OR breakfast. Obsessed is putting it mildly when it comes to how I feel about Udi’s breads lately. The millet chia one and I are full out in love and it’s not only because the macros rock my world (hello, 12 carbs per slice) but the heartiness and texture are spot on for gluten free bread. I used the white sandwich bread in this recipe mostly because I was being greedy and not wanting to part with my beloved millet chia but having tasted ALL of the varieties, any will do! One spoonful in and you won’t care if it’s bread pudding or French toast, you’ll just want MORE! 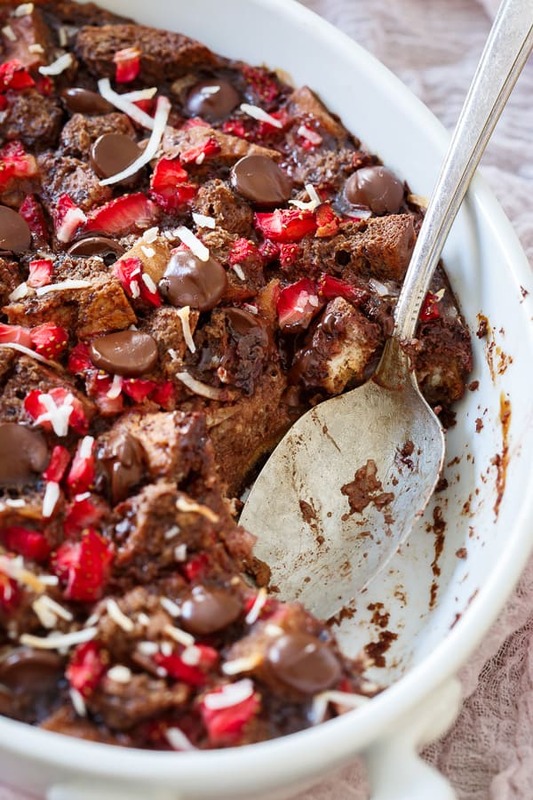 Love this chocolate strawberry bread pudding? Check out this fudgy paleo skillet brownie or these coconut almond butter truffles for more gluten free Valentine’s Day dessert ideas or sip on this roasted strawberry basil milkshake! 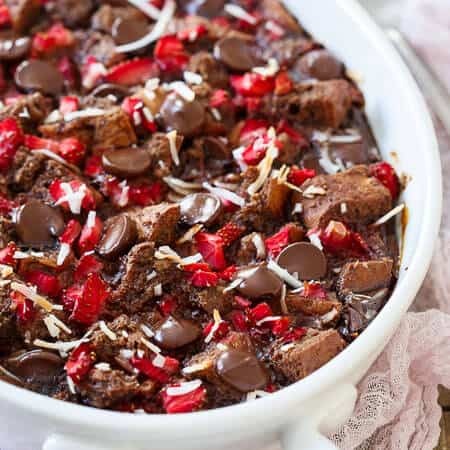 This gluten free chocolate strawberry bread pudding can be a decadent breakfast (perfect for Valentine's Day) or a deliciously chocolaty dessert! Melt 1/2 cup of the chocolate chips, coconut oil and coffee together in a small bowl and stir until smooth. Set aside to cool to room temperature. Whisk the eggs, coconut sugar and vanilla bean paste together until smooth in a large bowl. Gradually add the almond milk to the mixture and whisk until fully incorporated and smooth. Add the cubed bread to the mixture and mix well. Set aside for 15 minutes so bread can absorb the liquid. Preheat oven to 350 degrees and grease a baking dish with butter. Pour half the bread mixture into the baking dish. Spoon half the strawberries on top and half the remaining 1/4 cup chocolate chips. If using, sprinkle a little coconut on top as well. Pour the remaining bread mixture on top and repeat with the remaining strawberries, chocolate chips and coconut. Place in the oven and bake for about 50-60 minutes until the center is set. i literally had the same thought process in my head about bread pudding vs french toast before posting my bread pudding recipe today! I never thought about bread pudding and french bread being one in the same, but you’re right. There really isn’t a difference. Food for thought! I never thought about it until now, but honestly I really don’t see what the difference is between bread pudding and baked French toast. Someone probably just wanted to be different (AKA difficult) and come up with a new name. 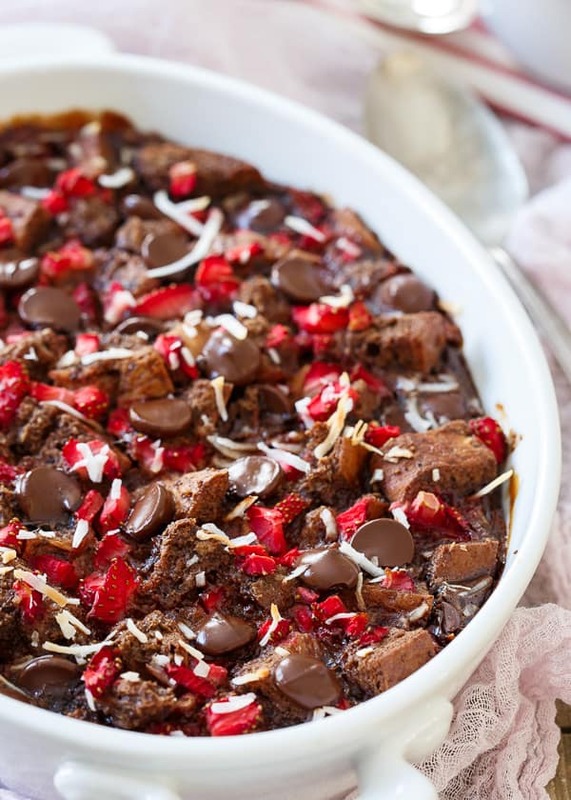 Whatever you call it this bread pudding looks so good with all that chocolate, strawberries and coconut! You nailed that video too! I want to DIG A SPOON INTO THAT and JAM IT IN MY FACE!! Holy MOLY!!! That should be my Valentine! ha ha! GORGEOUS! I can’t wait to try this! Ermagherd… this sounds amazing! I love chocolate covered strawberry ANYTHING and everything! Ohhhhh, how I love chocolate and strawberries together. What a great way to celebrate Valentine’s Day! Interesting question, I’d say bread pudding as well for this. Definitely must make this! Love everything about it, especially that it’s GF. I think I’ll make it with raspberries though, but either way–LOVE. I’m actually posting a french toast bake in a mug tomorrow that could possibly double as a bread pudding! I get your struggles lol! What ever this is called, Im sure its delicious, regardless of its name! You can have some leftovers tomorrow! Warmed up with whipped cream and nut butter…yummmmm. Finally–someone who understands my foodie struggles! I know it sounds illogical, but I’ve always been hesitant to make “bread pudding” because I already love baked French toast so much, and they are so similar. But this looks so incredible I can’t resist. Bringing up the decadence level with the melted chocolate should definitely help my brain process this as a dessert (so maybe I won’t eat the whole pan), haha! Thanks for the inspiration! You deliver, right? Because I definitely need a nice helping of this today! Just printed this out so that I can give it to my brother. He’s got to make this for his fiance for Valentines day! It’s so hard to find a good gluten free bread pudding recipe but this looks perfect! Forget Valentine’s Day – this looks delicious for anytime! Can’t wait to try these! I love that it is gluten-free and dairy-free!